7 days piano festival with concerts and lectures of Chopin. It is 200 years from his birth. 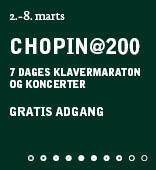 Chopin@200 Festival is arranged by Det Kongelige Danske Musikkonservatorium together with Det Jyske Musikkonservatorium, Palladium i Malmø and Den polske ambassade i København. It is free to attend the all arrangements of the festival. which was composed between 1830 and 1834. The Grande Polonaise brillante in E-flat, set for piano and orchestra, was written first, in 1830-31. In 1834, Chopin wrote an Andante spianato in G, for piano solo, which he added to the start of the piece, and joined the two parts with a fanfare-like sequence. The combined work was published in 1836 as Op. 22, and was dedicated to Madame d'Este.